In the absence of a suitable standard for measuring the reflective thin insulation, the company ALUTHERMO has always collaborated with the scientific world in order to determine the actual performance of its products. Unlike the measurement of loss through conduction, inapplicable to thin reflective insulation, which is expressed by the theoretical value R (thermal resistance), ALUTHERMO is focused on determining the performance of the different types of insulation in a more real base: measuring the energy consumption. The principle is very simple: the energy necessary to maintain a reference temperature (21°C) in an insulated construction, alternatively with an insulating ALUTHERMO® and with a “classical” insulator reference in winter conditions. Roof structure (1) alternatively insulated with Aluthermo Quattro (2), Aluthermo Optima (3), Aluthermo Densima (4) and 200mm glass wool conductivity λ 0.040 W/m.K (5). 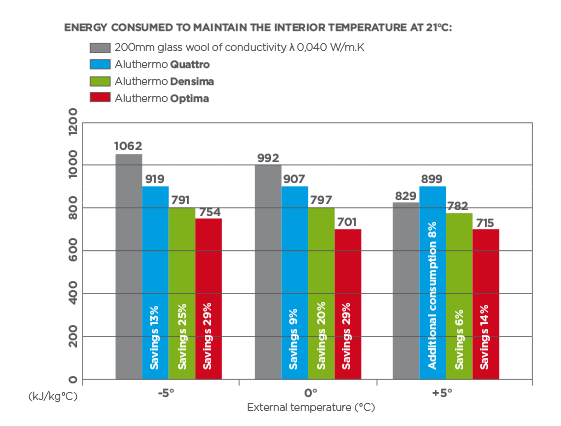 To conclude, it is clear that the thin reflective insulation Aluthermo® presents, under the actual usage conditions, higher perfomances than a classical insulation. *ELIOSYS is an independent company specialized in the reproduction of terrestrial climatic and environmental conditions in the laboratory. The conditions that can reproduce ELIOSYS include: the sun in Earth’s atmosphere, temperature variations from -70 to +160 ° C, the moisture management of 15 to 95%, the effect of hail, snow load and wind pressure.